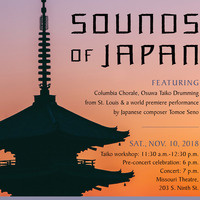 The University of Missouri (MU) Asian Affairs Center and the Choral Arts Alliance of Missouri (CAAM) are organizing “Sounds of Japan” at the Missouri Theatre at 7:00 p.m. on Saturday, November 10, 2018. CAAM will be performing with the iconic St. Louis Osuwa Taiko drummers for our Sounds of Japan concert! Partnering to celebrate the Asian Affairs Center’s 20th anniversary and CAAM’s 40th anniversary, the music will take the audience on an aural journey to Japan! There will be a pre-concert event of cultural activity booths and presentations from 6:00 p.m.